Our product range includes a wide range of fluidised bed opposed jet mill pqw dry grinding machine and dhm dry grinding system. In the past, multiple-step processing such as the conventional grinding-classifying-process with fine impact mills and subsequent coarse grain separation in an air classifier, was the process of choice. As LEIMIX launched the PQW fluidised bed opposed jet will onto the market in 2013, it succeeded in revolutionising jet milling. During expansion, the energy contained in the compressed gas in the form of heat is converted to kinetic energy. The speed of sound is initially a natural limit for the exit velocity. But by using Laval nozzles, the exit velocity can be increased to above the speed of sound. Laval nozzles are characterised by their hourglass shape, which widens downstream of the narrowest cross-sectional point, the nozzle throat. The length of the divergent part of the nozzle is adapted to suit the operating pressure. Compressed air of 20°C and 6 bar overpressure is frequently used as the grinding gas, and delivers nozzle exit speeds of around 500 m/s. As a result of drawing in gas and product from the fluidised bed, the speed of the gas jets sinks extremely rapidly after exiting the nozzles. Comminution is a result of interparticle collision in the jets of air and also in the core area, i.e. the point where the opposing jets intersect. Jet mills are impact mills which are used to achieve maximum fineness values at maximum product purity. Such particle sizes can only be obtained in connection with an air classifying step. Spiral jet mills have a static air classifier integrated into the mill housing, whereas fluidised bed opposed jet mills are equipped with a dynamic deflector-wheel classifier. The fineness is set as a function of the classifying wheel speed. All-important is a high product loading of the nozzle jets in order to achieve a high concentration of particles and than high impact probabilities. The patented nozzles were developed with this in mind. They consist of four small nozzles which as a result of their close proximity generate an underpressure at their common centre, and thus draw particles from the fluidised bed direct into the centre of the nozzle jet. The product level in the machine is controlled by means of load cells or by monitoring the current loading of the classifier drive. In jet milling, comminution is exclusively the result of interparticle collision in the gas jets. And because there are no machine components in the grinding zone, neither machine wear nor product contamination occurs. This is why jet milling is often used when contamination-free products are required. Jet milling is suitable for any material hardness value: from Mohs' hardness 1 (talc) to Mohs' hardness 10 (diamonds). Fluidised bed opposed jet mill for manufacturing powders with a steep particle size distribution and sharp top size limitation in the range < 5 pm to 200 prn. Grinding nozzles arranged around the periphery of the grinding chamber. Classifying wheel(s) arranged horizontally in the classifier top section. Cool and contamination-free grinding. Cleaning made easy by the hinge-back and removable classifier top section and the inspection deck in the mill housing. Monobloc ceramic classifying wheels ensure minimum wear when processing abrasive products. Lining: PU, ceramic or special-grade steel to suit the product. Horizontal or 3D nozzle arrangement, Megajet nozzles. Selective milling, semi-batch mode, automatic quality control for high quality. Load cells for product level control. Material feed via a feed metering system into the classifier head or direct into the milling chamber, or injector feed. The Agitator Bead Mill for finest Dry Grinding,For the dry grinding of mineral and ceramic raw materials the agitator bead mill DHM impresses with very high product fineness and high throughput rates with low specific energy consumption. DHM dry grinding Mill is an impact grinding system with integrated classifier and therefore ideal for products with steep particle size distributions. 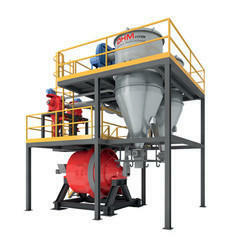 The multipurpose mill can be used for soft and medium hard minerals where wear resistant materials can be chosen.This innovative air OHM Grinding mill is capable of fine grinding all kinds of dry products with virtually no contamination.Through this specialized milling concept, product grinding is entirely autogenous. ball alone create the grinding energy. No tool wear occurs! DHM systems have been designed for dry milling hard materials. They are used for the continuous production of micronised powder. The production cycle is fully automated to offer a high production output and low energy consumption. An integrated dynamic classifier in the housing can be infinitely adjusted to the desired fineness. This guarantees exact adjustment of the grinding parameters and reproducible product quality. The horizontal mill drum rotates with x but optimum speed and moves/transmits the grinding energy to the balls. The comminution takes place between the grinding media by compression, friction and impact. The air ow allows a continuous process and a uni- form product ow through the drum. 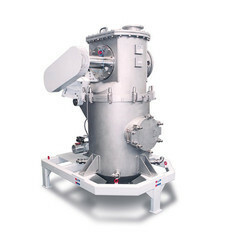 Product and air leave the mill drum and enter the external dynamic air classi er. The product neness can be adjusted fast and easily by changing the classi er wheel speed.